Courtesy of Nino Fazio, Strait of Messina, Italy. 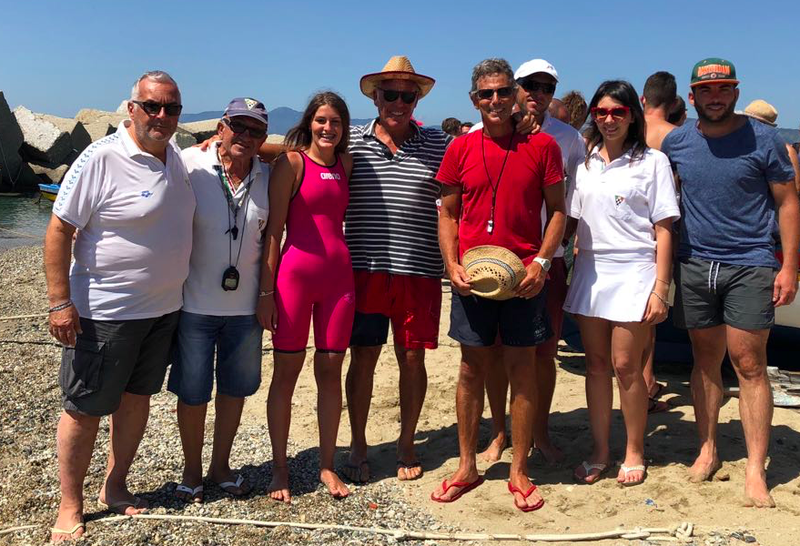 16-year-old Sarah Iannello from Milazzo (Messina) set a new female one-way record in the Strait of Messina. On July 20th escorted by pilot Giovanni Arena, Iannello swam from Capo Peloro in Sicily to Cannitello on the Italian mainland in 35 minutes 0 seconds that bested the previous record of 36 minutes 7 seconds set by Maria Torre in 2010. Nino Fazio reports, "Sarah's swim started at 8:35 am with both the sea and weather in excellent conditions. This was her second attempt in the Strait of Mession after a first attempt in 2016 that she completed in 46 minutes 44 seconds. Sarah's time is the overall sixth best time including all male and female swimmers. She already has a vast number of experiences in open water competitions because she is a veteran of the national championship races. The swim was organised by Baiadigrotta.it and the time was officially recorded by the timekeepers of the Italian Timers Federation FICR." For Giovanni Arena, it was the fourth record achieved with him at the helm, after Andrea Fazio's male single-crossing, Nino Fazio's male double-crossing and Maria Torre's female single-crossing record. Fazio explains why Arena is the preferred pilot in the strait. "Arena's impressive skills in leading swimmers across the Strait are best demonstrated by these numbers: 7 of the best 10 male times and 7 of the best 10 female times in the Gold Book of the Strait were done with him as a pilot."